that will help in the preservation of the environment. 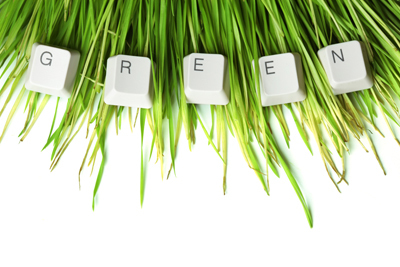 Here are some simple yet effective ways you can go-green at your place of employment. Rather than driving to work every day, risking the emission of harmful toxins into the environment, try arranging a carpool with co-workers. Not only will you reduce your carbon footprint, but you can also save a bundle on gas money as well. If your place of employment is generally close in proximity to your home, you can also consider riding a bike to work. You don’t have to necessarily ride your bike every day, but once or twice a week can substantially reduce the amount of carbon released into the air. If your job doesn’t necessarily require you to be in the office, let’s say for instance you’re some sort of writer and can theoretically work anywhere as long as you have computer and internet access, ask your employer about the possibility of working from home. Make sure to tell your boss telecommuting is a good way to eliminate cars on the road and can also be very cost effective—one less person in the office means less toilet paper and office supplies will need to be ordered. Even if you have to wear stockings and a blazer to work every day, that doesn’t mean that you can’t wear clothes that are safe for the environment. Believe it or not, there are tons clothes made from organic cotton, wool and hemp-based materials. Another option is to buy clothes from thrift stores and consignment shops rather than purchasing them new at department stores. And if at all possible, try to avoid purchasing clothes that need to be dry cleaned as most facilities use cleaning chemicals that are harmful to the environment. There are tons of easy things you can do in your office to go green. The first is to bring a few desk plants to decorate your cubicle. It will make your desk look more pleasant and absorb many indoor pollutions. Bring reusable containers for your home lunches and reusable dishes, silver and glassware to prevent the waste of paper products. Also remember to bring a dishtowel—you’ll need to wash these items and drying plates with paper towels is a no, no. You can also try to eliminate paper all together by emailing letters and converting all you files digitally. If you need to use paper for printing purposes, print on both sides of the paper. Whatever you do, make sure that if you do use paper to dispose of it in the proper recycling bins. Another good way to go green in the office is to invest in a power strip chord. Because all electronics can be inserted into this strip, including computers, printers, lamps and chargers, conserving energy can be as easy as flicking off a switch. If you want to persuade your coworkers to go green as well, sometimes it’s as simple as leaving your bicycle helmet on your desk. It can spark a lot of questions of why you ride your bicycle to work and you’ll have plenty of answers.